Leone Posod and Cindy, Treat Yourself, Inc.
LEONE: I am a lover of nature and enjoy spending time outside as often as possible. I aim to reconnect people to natural ways of healing, especially through cannabis. CINDY: I would describe myself as an easy going person, who like so many is seeking purpose and happiness. I am one half of a company called Treat Yourself. We specialize in healthy, high CBD, low THC edibles that are designed with female cannabis users in mind. LEONE: My best friend and business partner, Cindy! Cindy introduced me to the healing properties of cannabis, and once I began to notice the benefits for myself, I could not imagine pursuing anything else. Our mission with Treat Yourself is to empower women to trust their intuition and bodies to lead them towards the best method of healing and self-care. We believe that cannabis not only treats a plethora of ailments, we also find that it helps us tune in to more subtle messages from our bodies. We hope to help everyone find their way to a stronger self-care practice. CINDY: Like most major life shifts, there wasn’t one specific thing that inspired me to start my canna endeavor. Rather it was a bunch of small occurrences that all sort of aligned at just the right time. Let me see if I can highlight a few of these “occurrences” for you. First of all, about a year before I decided to start the business, I had recently become a certified health coach. I was very passionate about health and wellness and especially passionate when it came to the healing power of food. I wanted to help people, but I couldn’t really get excited about one on one counseling, and so I was stuck. I loved making delicious and healthy food and sharing it with people, so I considered entering the food business, but the corporate hurdles turned me off. This was right around the time when dispensaries were popping up all over the place. As a cannabis user and advocate, I excitedly went into my first dispensary and was immediately disappointed. If there is one thing I learned when becoming a health coach, it’s that sugar is BAD. Sugar feeds cancer, and it causes inflammation which is the root cause of so many illnesses. Yet here I am looking at all these edibles which are supposed to be medicine, and they are loaded with sugar! Not to mention, there were no vegan or gluten-free options. And I’m no girly girl, but all the packaging was so masculine and unattractive. In that moment, I saw opportunity. Not just an opportunity to sell stuff, but an opportunity to help people and to educate people about the importance of what they put into their bodies. But I couldn’t do it alone. That’s when the stars aligned. My childhood best friend wanted to quit her job and move to San Francisco. I was in Los Angeles, but knew it was a matter of time before I left for San Francisco. My boyfriend (now husband) had recently moved back to SF, but I didn’t want to move for a boy, so when I heard my friend mention she was thinking about moving, I immediately pitched her my business idea. Together, we came up with the name and we decided to move in together (in SF) and we wouldn’t leave our apartment until Treat Yourself was launched. Coming up with our mission statement was one of the first things we did, and our goals are pretty much still the same. LEONE: My personal cannabis journey had a very delayed start. From a young age I categorized cannabis as a “dangerous drug” and struggled when I would learn that someone I respected was a cannabis user. Through my teen years I began to accept the use of cannabis, but would never consume it myself. At age 20, I began working as a police dispatcher, and cannabis was suddenly forbidden (if I wanted to keep my job), so I quickly forgot about it. In the last few years of my dispatch career, I became a certified yoga instructor and found myself immersed in the health and wellness world. I began to learn more and more about plant medicine and the history of the war on drugs. Once Cindy proposed the idea for Treat Yourself, I knew this was something we were both meant for. I quit dispatching after 10 years and haven’t looked back since! CINDY: If I’m being honest with myself, my origin story has very little to do with cannabis. My origin story started during a low time in my life. At 25 years old I found myself living far away from friends, family, or any reliable cannabis connection. I felt isolated, alone, and helpless. Needless to say I was depressed. After some extensive online research, I started to change my diet. Within weeks I couldn’t help but notice how different my thoughts were. It was such an exciting revelation. My mind was so clear, my thoughts were happy, and I felt like all my senses were heightened. That was the first time in my life that I clearly felt the power of food. I learned about the health benefits of all sorts of foods, including herbs and spices. It changed how I looked at everything, really. Including cannabis. I had a higher appreciation for all natural remedies, and so I think it’s fair to say that it plays a major role in my current cannabis journey. LEONE: My superpower is my willingness to discuss cannabis with anybody and everybody! I’ve found that being open about my own use and what I hope to accomplish with cannabis has helped many people – family, friends, strangers – become more comfortable with the idea of cannabis use and its medicinal benefits. CINDY: My superpower is one shared by at least 50% of the population and that’s being a WOMAN! I don’t think we fully understand the powers we possess, I definitely don’t, but I feel like that is all shifting. This is an exciting time to be a woman, in the world, and in the cannabis industry. Not to sound like a total nerd/hippie but this planet needs healing and compassion, and as a woman, I feel powerful in knowing that I can freely spread that message. LEONE: As an industry we share the obstacle of cannabis classification as a Schedule I drug. In many ways this helps us to organize and collaborate, since we have a shared goal to deschedule cannabis. On a personal level I strive everyday to share with others why I believe cannabis is incorrectly classified as a Schedule I drug to help the movement towards cannabis acceptance and normalization. CINDY: An obstacle I face often is people’s misconceptions. When I was a health coach it was getting people to realize that fatty foods aren’t the foods responsible for making us fat. Now most of us know there are “healthy fats,” and that’s readily acceptable. In cannabis, there are SO many misconceptions. 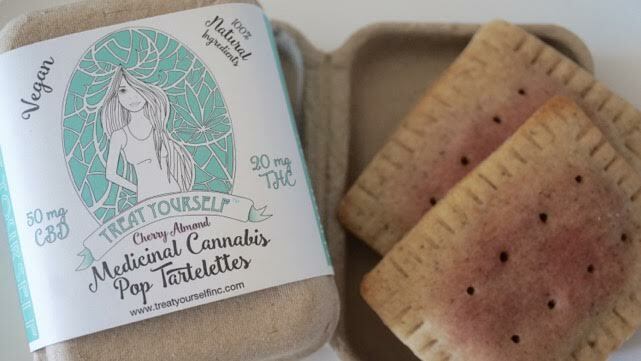 From the perception of the type of people who use cannabis, to the effects of cannabis, Treat Yourself is dedicated to educating the public in order to break these misconceptions. Treat Yourself as the brand is meant to shake up these misconceptions. If you look at our Instagram I think you get a pretty good feel of who we are and what we stand for. LEONE: My vision for women in the cannabis industry is that we continue to build, network, and support each other just as strongly as we have been. I believe that, as a quickly growing industry, it is important that we create relationships built on trust and respect, and I would love for women entering the industry to embrace this as a part of the industry’s culture. CINDY: My vision for women in this industry… I mean, I think we are Superheroes. I love and respect men, but I think women need to be the leaders in this. When it comes to business we live in a society where men know best, but cannabis is so new and such a complex business that nobody knows best. The rules haven’t been written so women need to step up and write them.